The naturalist Charles Darwin famously distinguished between “splitters,” those who divide the animal world into many species defined by small differences, and “lumpers,” those who prefer a smaller number of species based on more widely shared characteristics. This distinction came to mind as I strolled through the show of works by Tom Prinz and his son Christopher currently on view at Gallery 72. The elder Prinz is a splitter, quite literally. His works are collages made from many pieces of paper that each contain bits of color and suggestions of images. Working with newsprint, photos, and other bits of detritus, Prinz scans them, cuts the digital prints into strips, and then assembles them in a manner that heightens the role of process while de-emphasizing, or at least blurring, specific content. One inspects the edges of the strips wondering whether they have been cut or ripped, and also searches for patterns among the images even when the work as a whole seems destined not to cohere. The distancing effect of the fragmentation and layered representation is counteracted by the intimacy of the process by which the works are assembled, with the strips unevenly layered upon one another so that their ends protrude like scraps of wall posters that quiver in the breeze. Prinz often uses thread to stitch the strips together, highlighting the human hands at work in this welter of reproductions and reproductions of reproductions. Christopher Prinz, by contrast, is a lumper. With one very striking exception, all of his works are made out of a single, usually industrial material such as steel or cardboard. Some of the works are wall-hung, such as a series of “landscapes” that are more like singular chunks of terrain held up for us to inspect. Some of the works are freestanding, such as a grouping of “steel pillows” that are exactly what their name suggests. And some of the works extend down the wall and then outward when they hit the floor, inhabiting that middle ground between dimensions while suggesting that their shape has been forced upon them by the spot they’ve been asked to occupy. The exception to these descriptions of the younger Prinz’s work is an intriguing piece called the “Infinite Flowers in Every Direction Lamp.” Unlike his other works in this show, this piece was a collaboration that came about when Prinz was asked by friends to provide technical assistance to make their idea of a light fixture featuring live plants a reality. Prinz completes the scene with an acrylic table sitting under this slightly freaky chandelier, and the surreal element is continued with the plastic slip-ties used to hold all the pieces of acrylic together. A recent graduate of the Rhode Island School of Design, Christopher Prinz has recently joined MTRL Design, the innovative Omaha firm based in the Mastercraft Building that counts among its most valued team members a laser named Helga, whose talents make many of their products possible. It will be interesting in the years ahead to see how Prinz’s work as a designer and “executioner” of ideas, including ideas hatched in the minds of customers, influences what he chooses to show in galleries. While Christopher looks to the surface of the moon for inspiration, the elder Prinz points in both print and conversation to the late-medieval painter Giotto and the early Renaissance master Fra Angelico as influences, if that is the right word. Prinz does share with these distant Italian predecessors an interest in architecture, elements of which often serve to quietly define the space in which the work of the three artists unfolds. He also seems drawn to the Italians’ use of color, which is subtle and understated even as certain shades reverberate across the surface of their paintings and create harmony where at first glance there might seem to be only dissonance. But the more substantial connection, I suspect, is at the level of experience—both the experience of the maker and the experience of the viewer. While his son uses processes like “vacuum forming” to bring an expressiveness to otherwise fairly mute industrial materials, Tom Prinz uses a combination of traditional and digital approaches to capture the fleeting moments of vision and emotion that make up our daily experience. Whether you are a splitter or a lumper, this show is a great opportunity to see how diverse materials can become a vocabulary for commenting on the world around us. 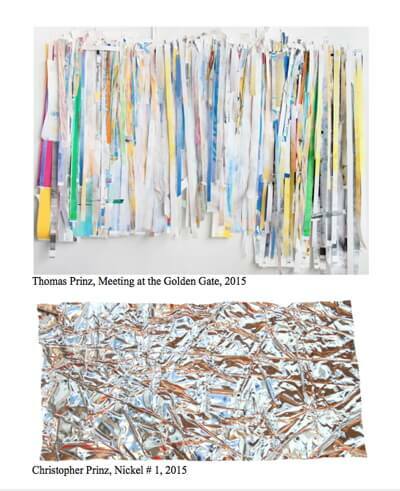 Thomas Prinz, Christopher Prinz: Paper + Steel will be on display at Gallery 72, 1806 Vinton Street, until April 11.